This is your post editor! Simply typing something in it and clicking the orange button will allow you to post a message for people to read! To post a song, movie, quote, book, or activity, you can click the icons shown here. They will pop up a panel where you can type what you're looking for. Here's the fun part! Begin your search by typing what you're looking for (like a song's title or an artist's name). As you type, below will appear media that might be the one you're looking for! In this example, we're using music. 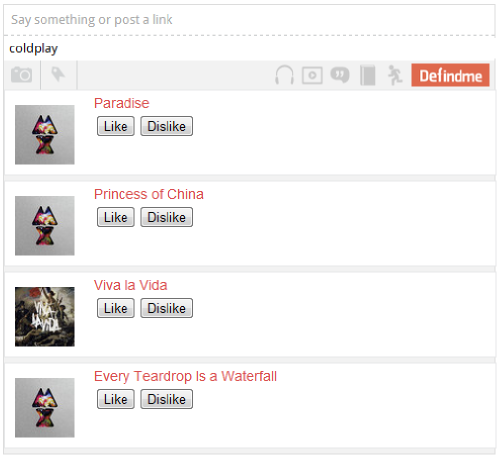 Once you find the correct item, press like or dislike and it'll be attached to your post! Your post will show up with the media item you wanted to attach! By posting your favorite (or least favorite) media, you'll get matched around with people all around the world who have the same taste as you and we'll send you recommendations from them too! You can also rate media that other people post by clicking on the orange Defindme button or putting your mouse over it and clicking thumbs up or thumbs down.